The generation of electricity by wind turbines on the Gunfleet Sands. Wind turbines are clearly visible on most days when looking seaward from the cafe. They are approximately fives miles offshore so their actual size can be deceptive. Having a total height above sea level of 127 metres they are almost as high as the London Eye. The rotors are designed to maintain a constant rotation during most wind speeds by alteration of the blades pitch. However, in the interest of safety, they feather out completely in high winds of above 60 m.p.h. Each turbine can produce 3.6 megawatts so the farm can generate electricity to service 125,000 homes. 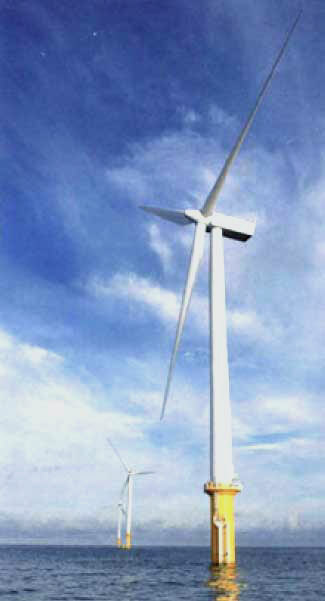 A further two very large turbines were subsequently erected with Siemens 6 megawatt turbines. They were the first offshore turbines in the world of this size and were used in an experimental capacity. They are now providing electricity to supply a further 12,000 homes. Britain's geographic position is fortunate. The wind around our shores could provide us with up to nearly three times our current national requirement. The government has set a target of producing 15% of our power from natural resources by the year 2020. Wind power is expected to be a major contributor to achieving this goal. With the added benefits of the reduction in carbon dioxide emission and less reliance on the import of foreign coal, oil and gas, the building of additional offshore wind farms around Britain is now considered to be a positive way forward. Before and during construction many cafe customers considered the erection of massive whirling structures was not their idea of beauty. Nowadays the wind farm, being five miles offshore and quietly unobtrusive, is tolerated and thought by many locals to be a worthwhile undertaking. Looking back over the history of the West Beach we find this is not the first time the abundance of the wind has been utilised in Clacton-on-Sea. The cycle started at the beginning of the 19th century when the docking of the sail-driven flat bottomed barges played a major role in the building of the town, (see our history page for more details). Now in addition to the wind farm, the Martello Beach is very popular throughout the year for the leisure pursuits of kite flying and windsurfing.